No more swelling or cracking floors or wood trim due to changing humidity levels. No more crawl space smells. No more molds and other wood destroying fungi in the crawl space. No more spiders, bugs or other pests in the crawl space and coming up into your home, eating your wood. Less dust and dust mites (whose droppings are a major cause of indoor allergies and asthmas). Less cold drafts and smaller temperature difference between layers of air in your home. Increases usable storage space by creating a mini-basement that stays dry, comfortable and bug-free. Traps termite poisons in the ground under the air and vapor barrier and keeps fumes outside of the home. Increase homeowner’s access to all areas under their house to run new wires, etc. Creates a tighter more comfortable home and 30-60% of everyone’s heating bills is a direct result of leakiness. Greatly reduces heat losses and gains through poor duct insulation which delivers more Btu’ to every room, and reduces bills by as much as 50%! Eliminates duct leakage to the outside from crawl space HVAC systems (which can reduce bills by 10-40% and eliminate problems like fireplace back drafting). Greatly reduces summer humidity levels, which can reduce your cooling bills by 10-15% since 30% of most alc’s capacity and energy is designed to be used for humidity removal. Reduces heat loss through water pipes which lowers your water heating bill, and it makes ho water lasts longer and get to every faucet faster. Eliminates the need for floor insulation saving money on the front end. This is especially true if the heating system is under the floor. Lowers both heating and cooling costs. Do you have any of these common issues in your home? My hardwood floors are cracking and buckling. Wood floors buckle and crack because the wood swells when it absorbs moisture and shrinks when it dries. The only way to keep them from shrinking and swelling too much is to control the moisture content of the wood. Ideally, it should be about 10% after post construction drying is complete. The main source, and usually the only source of wood moisture in our homes, is the water contained in the air on either side of the wood. If you maintain fairly constant relative-humidity (Rh) levels of 40%-60% on either side of the wood, it will neither shrink nor swell. Proper use of the Psychometric chart can easily prove that it is impossible to maintain constant Rh’s using air from outside. We try to create an air barrier around our living space so that we can maintain constant Rh’s of 40%-60% in our homes and good building performance professionals can easily accomplish that. The same scientific rules apply to the crawl space under your home. The only way to maintain fairly constant 40%-60% Rh levels is to stop all outside air, water and water vapor from coming into the crawl space, and that requires a relatively permanent water and vapor barrier. CleanSpace provides such a barrier. Properly installed, it will cause the crawl space to closely mimic the indoor humidity levels. The relative humidity on both sides of the floor will be almost the same and the actual water content virtually identical. Plus, we can keep our homes in the comfort range, 40%-60% Rh, which is what the wood floors will experience also. Testing has clearly shown vented crawl spaces to have extreme swings in Rh over the seasons, from as little as 20%-30% Rh to as high as 80%-90% in the same crawl space. Such extreme levels cause the wood moisture content to vary to the same degree causing the wood to shrink and swell beyond design limits, which results in the cracking and buckling. CleanSpace will eliminate these giant swings. Humidity and wood moisture level remain fairly constant and well within the wood workers designed limits. The result -no more buckling and cracking floors and woodwork. There's a smell coming from my crawlspace. Crawlspaces smell bad because they are full of bad things. Molds, yeasts, bugs, rodents (and all of their associated decaying remnants), termite poisons, stored chemicals and trash from the last four homeowners, their plumbers and service technicians, and even the builder and his brick layers. Also because we ventilate them, the crawlspace is always full of water and water vapor (humidity) that helps things grow and decompose which causes all of the bad smells. The air quality in most crawlspaces is absolutely abysmal and it is all located only inches from our living space. To make matters worse, much worse, the way we build floors and duct designs guarantees that there is very little real air barrier between our families and our crawlspace. Creating a true air and vapor barrier at the floor level is all but impossible. Also the way we build crawlspaces guarantees they will be one of the worst environments on the planet. (Recent studies show crawlspace mold counts higher than any found in scientific literature). We barely take steps to keep rodents out and make almost no effort to prevent bugs other than filling the ground and crawlspace walls with termite poisons. We encourage outside air through ventilation with its extreme temperatures and humidity’s to come in and pour over our ducts and under our floors. In any but the driest climates, it also guarantees high humidity levels for long periods which guarantees mold and fungus growth. Will my furnace make the air too dry? Contrary to popular belief, furnaces and heaters don’t dry out our air in winter and putting a humidifier on our duct systems is the worse possible thing we could do to combat the dryness. Indoor winter dryness is caused by house and duct leakage and throwing water into a dark duct system is one of the fastest, most assured ways of growing unhealthy mold and spreading it all over your home. Excessive indoor dryness causes many problems; drying, cracking wood; itchy eyes, nose & throat irritability; frizzy & static hair; dry skin & lips; cracking, peeling nails; increased breathing problems for many and a need to keep our thermostats at higher, more expensive temperatures to feel the same degree of comfort (water holds more heat than air, therefore moist air makes us feel warmer). There are two possible remedies; add more water to the air and/or limit the cause of the dryness — infiltration of outside air into our homes. While adding water to the air may be part of any overall strategy to eliminate excessive dryness, great care must be given how it is achieved. Water is the life source of molds, dust mites, termites, and other unwanted pests. If it is pumped into our home improperly it can result in excessive wetting, which will lead to such problems. That is especially true in homes, which have poorly insulated areas, weak windows, or air leaks – In other words, almost every home in America. Remember, warm moist air will condense water on any cold surface below its dew point. As you put water into the air you raise its dew- point (the temperature at which it will sweat) and increase the chance that your windows will sweat and that cold spots on your wall, floors and ceilings will mold. And, worst of all, any leaks in your home will allow the warm. moist air to get into your walls, ceilings and floors where eventually it will come into contact with a surface cold enough to condense water. As a result, you will have wet, moldy, deteriorating areas inside your walls, ceilings and floors where you can’t see them until it’s too late. The safer, wiser first step is to limit the cause of the dryness. This will reduce the amount of water you have to add to the air, and reduce the chances of unwanted condensation problems. The only way to reduce the cause of indoor dryness is to reduce the number and size of house and duct leaks. Cold air holds so little water that even on a rainy 40 degree day with 100% relative humidity outside (the outside air is holding the maximum amount it is capable of), when that air comes into our 75 degree home its relative humidity will fall to under 29%Rh. That’s because 75 degree air can carry 3 and one third times as much water as 40 degree air. The source of dust in homes is no mystery. Much is unavoidable – skin, hair, fabrics, body powers and pets all leave their dust to float, settle and irritate. Regular dusting and quality air filtration can handle most normal dust. Real dust problems occur when our living space is invaded by outside sources of dust and dirt. And, that regularly happens as a result of house and duct leakage. All houses leak and the worst leakage is always at the top and bottom of the house. Almost all past energy efforts went into making the sides tighter. Better doors and windows, house wraps, drywall interiors and sheathed exteriors all make the walls in almost every home the tightest exterior surface. The floors and ceilings, meanwhile, have become more and more peppered with holes. Our homes have more wiring, plumbing, recessed lights, cantilevered-levered ceilings, hardwood floors and duct penetrations than ever before. Almost no effort is made to seal them and they are connected to two of the dustiest, dirtiest places known to exist- our attics and crawl spaces. To make matters worse, much worse, both our attics and crawl spaces are vented to the outside. As the warmest air in our home rises, it leaks out our ceilings many cracks and holes and escapes to the outside through our roof vents. An equal amount of cold air is thereby drawn into our home through the crawl space vents and our very leaky floors. In the summer, the process can reverse. And, when the wind blows, the process is multiplied many times. Besides raising our bills, making us uncomfortable, and destroying our humidity control, this incoming air brings all the dust, dirt and it can carry from our attic and crawl space into our homes. A leaky duct system, like a strong wind, also puts a large pressure on our house that multiplies overall house leakage and increases the introduction of unwanted dust. A leaky return duct in a crawl space, for example, will pull the crawl spaces foul, dirty air directly into your system and spray it all over your home. CleanSpace seals off the bottom of your home and make it as tight, or tighter, than the walls of your home. It isolates any ducts in the crawl space from outside air and all of the dirt and nastiness of your crawl space. It puts all of the dirt and other nastiness on the other side of a 20 mil, 7 ply liner that is warranted for 25 years. Since the ceilings of you home will be the only remaining leaky exterior surfaces, they will leak a lot less. Like a straw with only one end open, nothing will come in or out of the other end. Of course, you should still air seal the ceiling and add insulation in almost every home for additional savings. Dust mites as their name suggests eat dust. And dust, like mold spores, is everywhere and we can’t get rid of it. Fortunately, like mold spores, dust mites need more than something to eat. Like mold, they require high humidity to live and reproduce. In fact, they require almost the exact same high levels of humidity that mold does. If you keep your humidity levels below 5 5-60% Rh, and regularly dust and vacuum, dust mites and mold won’t be able to live in your home. Studies have repeatedly shown these to be the only methods to eliminate such problems. Clean space, by sealing your home from the major source of humidity problems — our vented crawl spaces- is a required first step to control dust mites and eliminate their unwanted by-products (See section on humidity, dryness, and mold for further details). CleanSpace not only eliminates much of the dust and dirt dust mites eat, but also eliminate water from the crawl space which is their real Life source. Clean Space, as a result, makes every home tighter, more comfortable, with better humidity control and a lot less dust with a greatly reduced chance of dust mites. Cold, draft homes are uncomfortable and expensive. They are always too cold at the lowest levels and too warm at the highest levels. This stratification’s of air by temperature and cold drafts are all a symptom of one cause- house leakage. And, house leakage is caused by holes in the exterior of the home and duct systems. There is a rule in science — in any given air mass, the temperature and humidity in that mass will be equal no matter where you measure it. If your home has one temperature and humidity in one place and a different one in a different place, you aren’t living in an “air mass,” you are living in an “air flow”! All houses leak and the worst leakages are always at the top and bottom of the house. A typical “leaky” house will allow all of its indoor air to be replaced by outside air in 2-3 hours. A house with leaky ducts, which pressurize the house whenever the air- conditioner runs, can have all of its air replaced in as little as 20-30 minutes. For instance, a 2,000 sq. foot home has 16,000 cubic feet. Typically, they will put a 4-ton unit on such a home and it moves 1,600 cubic feet of air per minute. If its return is broken in the crawl space it could pump the house full of outside air in only ten minutes. Almost all past energy efforts went into making the sides tighter. Better doors and windows, house wraps, drywall interiors and sheathed exteriors all make the walls in almost every home the tightest exterior surface. The floors and ceilings, meanwhile, have become more and more peppered with holes. Our homes have more wiring, plumbing, recessed lights, cantilevered-levered ceilings, hardwood floors and duct penetrations than ever before. Almost no effort is made to seal them and they are connected to two of the dustiest, dirtiest places known to exist- our attics and crawl spaces. CleanSpace’s ability to seal your home at the critical bottom of the structure greatly reduces unwanted cold drafts and greatly diminishes the stratification of temperatures in your homes. Your home will become more of an “air mass” and less of an “air flow”. Temperatures room-to-room and floor-to-floor will become closer and more comfortable. Anyone who has tried to store anything in a vented crawl space can tell you that it is barely better than leaving it in the rain. And, you wouldn’t have to enter that nasty, stinky, spider-web filled crawl space with everything crawling and oozing around you. Crawl spaces aren’t pleasant places. We wouldn’t want our children under there. Heck, we don’t want to go under there. Whether it is to pull a new wire or check a pipe, we would rather pay someone to go or go without, than to crawl in that ugly, creepy place. Humidity levels are terrible. Anything that can rot will rot in the crawl space. And, since it is so open and humid, bug, vermin and fungi find it an ideal place to set up house. Hardly the place you would want to store anything. CleanSpace eliminates every one of these problems by providing an air and vapor tight 20 mil, 7 ply reinforced liner between the crawl space and all the nastiness of the ground and outdoors. Humidity levels remain almost identical to those inside your home and all of the bugs, fungi’s and other nastiness are sealed out. Stored items are almost as protected as they would be in your home and access to them will be so clean you will readily let your family go into the crawl space for the first time. CleanSpace provides the only workable solution. Properly installed it traps most of the causes of moisture and bad odor in crawlspace under its 20 mil barrier. Urine, feces, ground molds and fungi, termite poisons, old spills, decaying matter and most living matter (bug, rodents, etc.) are all isolated from your crawlspace, and since CleanSpace seals the crawlspace from the outside air, it prevents the extreme swings in temperature and humidity. The temperature and Rh of the crawlspace will now mimic our indoor environment. Any remaining mold spores will go dormant and eventually die since they will no longer have long periods of high humidity which they require to grow and multiply and it’s the growing and multiplying that causes bad odors. 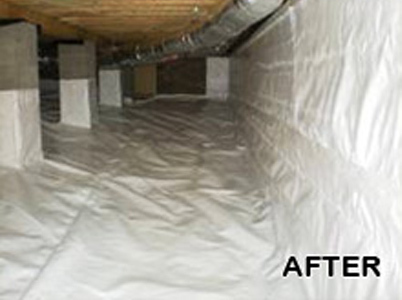 CleanSpace provides a thorough air and vapor barrier for your crawlspace, which isolates most odor causing agents outside, and kills those remaining inside by eliminating their source of life-high humidity. No more crawlspace odors and smells. The main cause of cold floors is cold winter air blowing through our crawlspace vents stripping heat from the floors. Air sealing the crawlspace is all it takes to eliminate this problem. Studies have repeatedly shown that floor insulation over crawlspaces is almost worthless. An extensive study in Ohio clearly demonstrated that installing floor insulation has almost no effect on heating bills. A current study in North Carolina is proving the same point. They have sealed up a series of crawlspaces and compared them to identical vented crawlspaces. In some of the test homes they left the floor insulation in and in some they removed the floor insulation. Homes without the floor insulation are actually performing better than those with floor insulation and much better than those with ventilated crawlspaces. And that is especially true if there are heating ducts and equipment in the crawlspaces. Clean Space provides ideal protection from cold outside air coming into the crawlspace and stripping heat from the floors. It also helps trap in the crawlspace any heat loss from the furnace and ducts which are located under the floors. It provides a complete, thorough air barrier that covers all the crawlspace wall, vents and ground. No cold air can come into the crawlspace and warm doesn’t escape. 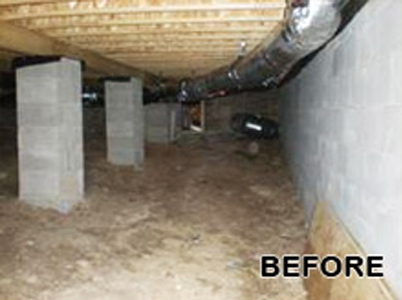 Even without heating ducts and heating equipment in the crawlspace, Clean Space will significantly reduce cold floors. Since our floors are built very leaky and because Clean Space seals the crawlspace airtight, the only air exchange will take place between the heated home and the now protected crawlspace. crawlspace temperatures, as a result will follow indoor temperatures and humidity levels instead of outside levels. The results- no more cold floors. Molds and other fungi are everywhere. They’re in the air, on every surface we touch, we breath them, eat them, get them in our eyes and noses. They are small enough to get through any crack or hole in your house and can pass through most filters. Getting rid of molds and fungi is impossible. Fortunately, it’s also unnecessary. There really is no such thing as a mold problem; there are only moisture problems. Yes, mold growth in crawlspaces has become a huge issue, preventing many from selling their homes and causing numerous high-profile lawsuits. Yes, many people are allergic to mold and it is irritating to even more. Yes, it smells bad and destroys materials such as cloth, paper and wood. And yes, any growing colonies must be destroyed. But you can’t kill all the mold, it’s everywhere. You can, however, make it impossible for them to settle and grow. Molds and fungi have very basic requirements for life, most of which we can’t control. They eat most anything and our homes are built out of their foods — cellular materials like wood and carpet. They don’t like light, especially ultra-violet, but there are plenty of such places in our home and our crawlspace is almost completely protected from such sunlight. Finally they need water-Relative humidity levels that stay over 60-70% Rh for more than a couple of days will create mold growth. Of the three, the only one we can control effectively is the amount of water they have available. If we keep crawlspace relative-humidity levels below 60%, no mold can grow. And the only way to do that is to create an air & vapor barrier that keeps outside air & water from entering the crawlspace. Conventional wisdom says that we should ventilate our crawlspaces to remove humidity. Well we’ve been ventilating them for many decades and the results are in — ventilation doesn’t work. Vented crawlspaces are some of the nastiest, moldiest environments in the world. In fact, researchers who are currently studying crawlspaces in North Carolina found higher mold spore counts in vented crawlspaces than they could find in any other literature, anywhere. The continuing results of their research can be viewed at Crawlspaces.org and it clearly shows that sealing crawlspaces is the only practical way to control relative humidity and wood moisture content. The reason venting doesn’t work is that the outside air we are using has way too much water in it to dry anything. That is especially true when you allow hot, humid air to enter your cool crawlspace. Warm air can carry much more water than cool air and so when you cool down hot, humid air, its “relative” humidity soars. The research project in North Carolina is proving convincingly that it isn’t water from the ground that causes the mold problems. Their “control” group crawlspaces have 100% plastic on the ground and open vents. These crawlspaces have stayed over 60% Rh throughout the test, which has now run for over one year. These same crawlspaces have more than 70% relative humidity levels 79% of the time, virtually guaranteeing mold growth. And the wood-moisture contents have stayed well above 10%. The crawlspaces that have been sealed air-tight to prevent humid outside air from coming into them have stayed under 60% Rh for the entire year, making mold growth impossible. And the wood dried from 15-20% moisture content when ventilated to 8- 11% moisture content after the crawlspaces were sealed. Daily testing in Arkansas of over 60 homes during the summer of 2002 proved again that crawlspace venting actually causes the moisture and mold problems. Every single crawlspace tested had relative humidity levels well over 70% and clear evidence of mold growth. They all had open vents and most had plastic on the ground, just like the codes and Termite Company’s mandate. The bottom line is this, if you want to guarantee that mold won’t grow in your crawlspace, you must stop outside air from getting into the crawlspace. And the best way to do that is to install CleanSpace. CleanSpace provides a complete air and vapor barrier for. your entire crawlspace. No outside air or humidity can get into the crawlspace and the crawlspace will have constant low humidity levels, which prevent mold from ever growing. And since the crawlspace in every home is well connected to the living space, it also means there is a greatly reduced possibility of mold growth in your home. Spiders, bugs, snakes and rodents all get into our crawlspaces the same way – through holes from the outside. Whether they find the holes by seeking heat, air flow, odors or just through pure blind chance they came in and find a very inviting habitat–protected from rain and snow, fairly constant temperatures, no harmful solar rays, lots of humidity and plenty to eat. They quickly rand readily spin their webs, build their nests, dig their burrows and begin their life cycles just beneath our feet. They live, eat, urinate, defecate, die and decay just inches from where our babies crawl and there is barely an barrier between them. (Hardwood and carpeted floors are purposely built with gaps between every board to allow for swelling). To make matters worse, floors are full of holes and cracks. Besides floors being built leaky with gaps between every board to allow for swelling, they also are chock full of holes that allow all of these pests to enter our living space. Plumbing and electrical hole predominate, but large floor joists are easily large enough to let most bugs in. Experience and testing have shown that sealing a floor from the nasty crawlspace is extremely difficult and almost always unwise. The crawlspace in summer is too humid, the house too cool, and the floor insulation too poor to prevent condensation, mold, termites and wood rot. The only good answer is to completely seal the crawlspace off from the outside with CleanSpace. CleanSpace seals all holes through the perimeter wall and traps all previous residents and their remnants under its 20 mil liner. So obviously, if CleanSpace can keen them out of your crawlspace it will also keep them out of your home.